James Yarrow was the second of the three children of James Yarrow and his wife Mary Gothard of Little Thetford, Cambridgeshire, England. 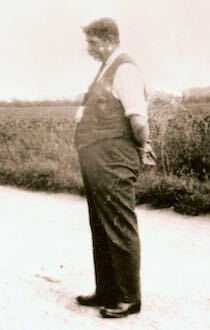 Above: James Yarrow at Wilburton Station, circa 1930. Photo: Andrew Martin. James married Adelaide Bishop, a School Teacher from Wicken, Cambridgeshire in 1896 at Little Thetford. They went on to have 15 known children (although my Gt. Grandmother believed that there were another 6 who died young). The family moved in 1899 to Wilburton and lived in the Wilburton Station Cottages where James became Station Master for the Great Eastern Railway (GER). In the later wartime years, the family moved to Wilburton old Vicarage - The Lodge, which still exists today with its stunning views across the fenland. James pre-deceased his wife by 19 years, and died on his 71st birthday. 1st May 1875 at Little Thetford, Cambridgeshire, England. 30th May 1875 at St. George's Church, Little Thetford, Cambridgeshire, England. Adelaide Bishop (1877-1965) on 20th October 1896 at St. George's Church, Little Thetford, Cambridgeshire, England. Adelaide Mary Yarrow (1897-1984) married Leonard Frederick Plumb (1895-1953) and later to Samuel Spencer Ambrose (1894-1961). 1881: 5yrs, Front Street, Little Thetford, Cambridgeshire, England. 1891: 15yrs, Front Street, Little Thetford, Cambridgeshire, England. 1901: 25yrs, The Vineyards, Little Thetford, Cambridgeshire, England. 1911: 35yrs, Railway Cottages, Station Road, Wilburton, Cambridgeshire, England. 1st May 1946 (his birthday) at The Lodge, Wilburton, Cambridgeshire, England, aged 71yrs. 8th May 1946 at Wilburton Cemetery, Wilburton, Cambridgeshire, England, with his wife Adelaide.